where Oq is the right ascension of the Greenwich meridian or the sidereal time at Greenwich (Appendix J). Thus, the first-order terrestrial magnetic field is due to a dipole with northern magnetization pointed toward the southern hemisphere such that the northern end of any dipole free to rotate in the field points roughly toward the north celestial pole. The end of the Earth's dipole in the northern hemisphere is at 78.6° N, 289.3° E and is customarily referred to as the "North" magnetic pole. Frequently, dipole models in the literature use the coordinates of the North magnetic pole and compensate with a minus sign in the dipole equation. The above calculations were performed for 1978 by adding the secular terms to the Gaussian coefficients of epoch 1975. The location of the dipole in 1975 can be similarly calculated and compared with the 1980 dipole. That comparison yields a 0.45% decrease in dipole strength between 1975 and 1980 and a 0.071-deg drift northward and a 0.056-deg (arc) drift westward for a total motion of 0.09-deg arc. The field could be converted to geocentric inertial coordinates using Eq. (H-14), but the exercise is arduous and not particularly instructive. However, we may take advantage of the dipole nature of the dominant term in the field model to approximate the magnetic field of the Earth as due to a vector dipole, m, whose magnitude and direction are given by Eqs. (H-18) through (H-20). Thus, where R is the position vector of the point at which the field is desired. Because this is a vector equation, the components of B may be evaluated in any convenient coordinate system. 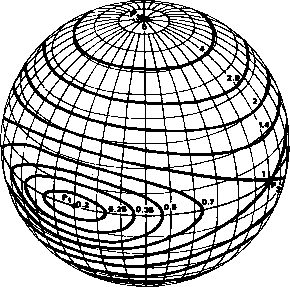 As an example, the field in geocentric inertial components can be obtained from the dipole unit vector, .